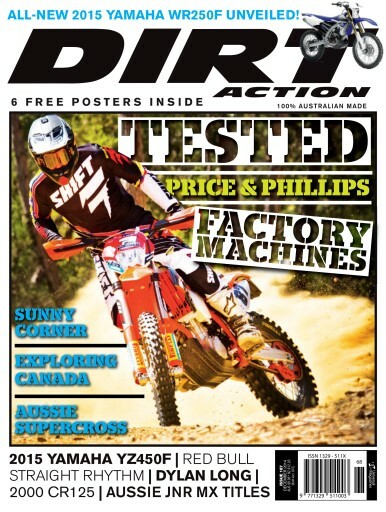 DIRT ACTION issue 187 contains within its pages a once in a lifetime chance to ride two of the hottest off-road bikes in the world. We test Toby Price’s AORC winning 450EXC and then jet half-way around the world to test Matt Phillips 300EXC, fresh from winning the 2014 world title and on the same special tests he finished his epic year on. From there we take a trip to Canada and explore some of the most amazing trails and scenery on the planet. We return Australia to check out the supercross series, test the 2015 YZ450F and speak to Dylan Long and you know what, there’s way too much stuff in here to list so wait for the gate to drop and panic rev your way into the issue!